In celebration of Canada Day, here’s William Shatner ‘singing’ Oh Canada (yes, that’s our National Anthem). I’d write a longer post, but I have to hitch up the dog sled so I can harvest some Maple Syrup. https://i0.wp.com/www.bullmarketfrogs.com/wp-content/uploads/2013/06/tumblr_kxdy0xcm5w1qazfbo.jpg?fit=500%2C333 333 500 Carol http://www.bullmarketfrogs.com/wp-content/uploads/2015/06/bullmarket-logo.png Carol2013-06-28 17:10:172013-06-28 18:02:26Raw Green Tripe for Dogs - Stinky Magic! We’ve created a new webpage to make potential French Bulldog owners aware of the potential health risks associated with merle French Bulldogs, and to warn them to avoid merle French Bulldog puppies for sale. 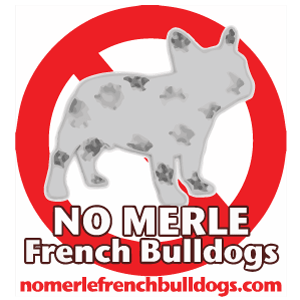 No ethical French Bulldog breeder would breed or sell merle French Bulldogs. The gene for the merle pattern is not found in French Bulldogs. The only way to ‘create’ a merle French Bulldog is by breeding to a dog of a breed that carries merle – generally Chihuahuas. The resulting puppies are then crossed back to each other, allowing the ‘breeder’ to claim that their dogs are purebred Merle French Bulldogs. Breeding merle to merle results in an average 25% of the puppies produced being ‘double merle’ – more accurately called a homozygous merle, and sometimes referred to as a ‘lethal white’ dog. Double merles have been documented to be as high as 86% blind, deaf or deformed. Double merle has also been linked to allergies, autoimmune disorders, organ defects, neurological defects and even death. This weekend at Pawsway in Toronto is “Meet a Frenchie Puppy” weekend! We’ll be there, representing Eastern Canada French Bulldog Club. Come out, ask questions about French Bulldogs, get referrals to reputable French Bulldog breeders, learn about adopting from rescue or becoming a volunteer, meet a French Bulldog specific trainer (and her trick trained Frenchie! ), talk to breeders and (yay!) get to pet some puppies!! I heard a rumor Phoebe might be there – and one other special surprise guest (or two!). Your friendly, on leash pets are welcome to attend with you. Admission is free – donations to Eastern Canada French Bulldog Rescue Rescue are appreciated!